SPARRC had a gala evening at Sir Mutha Venkatasubba Rao Concert Hall, to celebrate the release of the book Fitnesse written by Dr Kannan Pugezhendi. The Chief Guest was the Honourable Governor of Telangana and Andhra Pradesh Mr ESL Narasimhan accompanied by Mrs Vimala Narasimhan Lady Governor. There was a musical extravananza by playback singer Mr Srinivasan and a conversation with Dr Pugazhendi on fitness by Radio Mirchi Fame RJ Shaw. 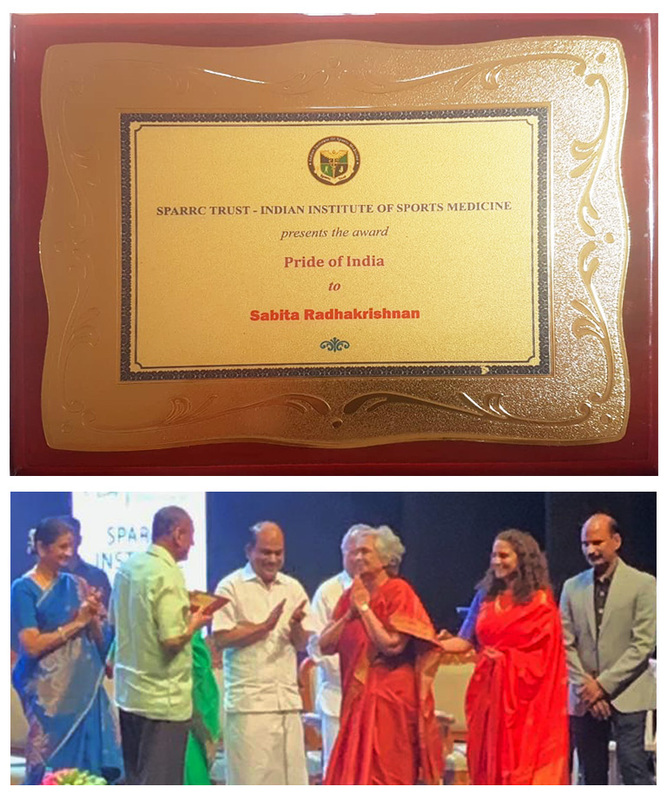 A few eminent citizens of Chennai were honoured and one of them was Smt Sabita Radhakrishna, and the Award called Pride of India, which was presented to her by the Governor. She briefed the audience on Udhavi and the work it did. She spoke about the core group and the battery of enthusiastic volunteers. She praised the work they did, as it did not give them money or glamor. It gave them something more. She said that the best payments Udhavi received were the word of appreciation from an elder, whom Udhavi helped She touched upon the need for care and compassion for elderly . She said Udhavi’s USP was stave off loneliness. Money is the lowest form of charity according to her. It’s the time, efforts and care that makes a difference to the lives of people. As part of the International Women’s day celebrations, the Probus Club of Chennai – awarded the “Probus Award of Excellence – 2017” to Ms. Sabita Radhakrishna, founder of UDHAVI. The function was held at the Russian Centre of Science and Culture on 7th March 2017. Mr. Mikhail Gorbatov – Director Russian Cultural Centre of Science and Culture, Proban R.T.Namasivayam, President of Probus Club of Chennai and Proban N. Rammohan, secretary of the Probus Club of Chennai were part of the awards ceremony. The scroll of honor given to Ms. Sabita on the occasion highlighted her contributions to the society through UDHAVI and also her contributions to the textile industry, specifically to the upliftment of economically weaker artisans. In her acceptance speech, Ms. Sabita thanked team UDHAVI and said that this was an award she is receiving on their behalf. She contributed her success to the support and encouragement from her husband and mother. She said that a smile in the faces of the beneficiaries of UDHAVI is the motivation that energizes the team. The Probus Club of Chennai ( sponsored by the Rotary Club of Madras) is an association of retired and retiring professionals, businessmen, government servants and others. Its not often that you get to rub shoulders with celebrities like the Duke and Duchess of Wellington and more importantly show them our treasured textiles against the backdrop of Kancheepuram with its layered history of temples and silks. A wonderful couple they soaked in everything I had to say as my friend Manick showed them round a temple with its carvings which was an inspiration to design on pattu sarees. The magic of the looms unfolded before them as the artist the weaver sat in quiet concentration involved in his own taal to create masterpieces in silk. We saw the warp stretched on the streets not a common sight any more. We saw hanks of brilliant coloured silk yarn and women loading them on to bobbins. The Duke and Duchess walked through a display of traditional silks not able to resist a few buys. We were tired but happy as we left the showroom. As for me it was a welcome break after 6 months of hibernating...and I felt honoured to be chosen to accompany them....I felt humbled as usual to see the master weaver at work. may he never abandon his glorious vocation. As if all the excitement of visiting Kancheepuram was not enough, Lord Peter and Lady Suzanne Ricketts visited our home. He was the British Ambassador In Paris, and they both came across as such wonderful people, warm and appreciative. The Queen of England stayed with them on occasions! They had lunch with us, and were delighted to meet my mother. They wanted a demo of what I had cooked, and after enjoying every dish on the table and expressed I their appreciation. I took them through a textile discovery through my own collection of fabric and textiles, and gave them a power point presentation of national textiles. 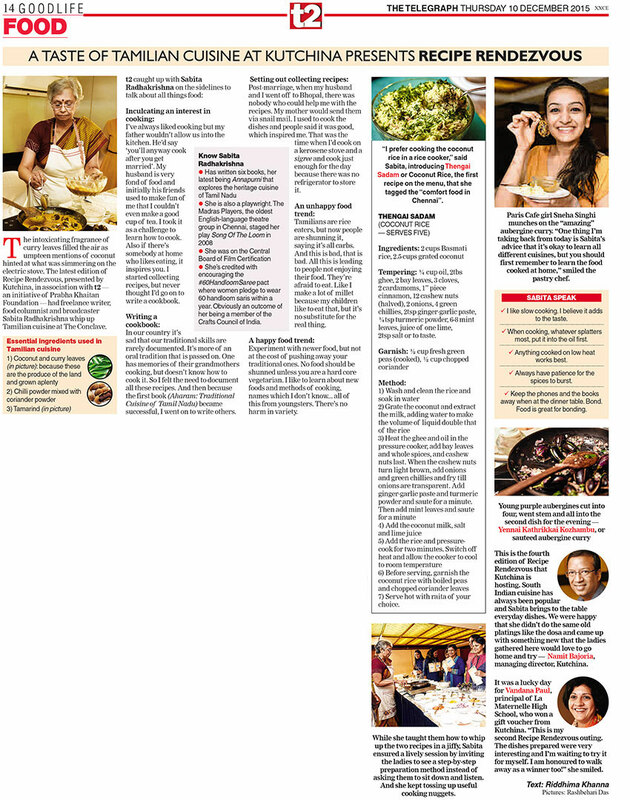 Sabita Radhakrishna was invited to speak at the Orissa Literary Festival 2015 on food writing. The other panellists were Priya Kapoor publisher Roli Books, and Pushpesh Pant, Author and well known foodie. The event was efficiently conducted by Shampa Kamath and attended by luminaries from the literary world, with eminent speakers. 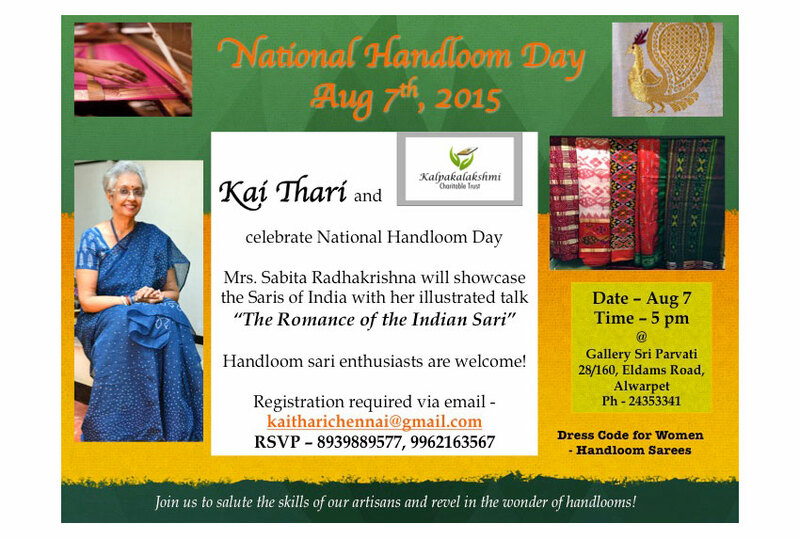 Kai Thari's 1st event is on August 7th, 2015 in celebration of National Handloom Day. 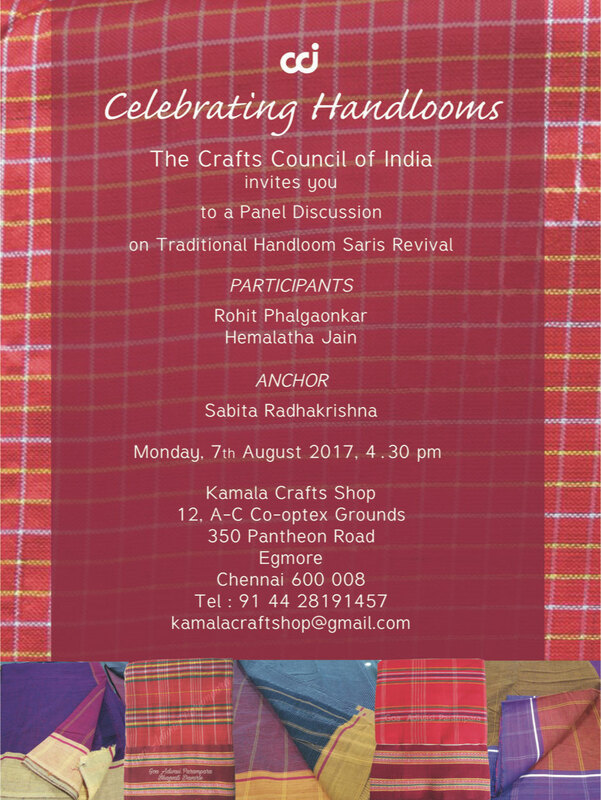 Mrs. Sabita Radhakrishna will give a talk on Saris of India to handloom enthusiasts. The venue is Gallery Sri Parvati at Alwarpet from 5 p.m. onwards. Invitation enclosed in a separate attachment. Launched on Facebook on May 24, 2015, Kai Thari’s membership has grown to 1,500 members in just over 2 months. Kai Thari happened when Sabita Radhakrishna announced a '60 Handloom Saree Pact' on May 23rd inviting women of all ages (particularly between ages 25-45), to join by wearing handloom sarees to appreciate the same. Sumita Pai felt that a focussed group could be created and maintained so that women are comfortable sharing pictures within an enclosed space on social media. Her keen interest in the handloom industry was propelled by the Government's decision to repeal the Handloom Act in April. This was later withdrawn based on online petitions followed by an appeal from MP Kirron Kher in Parliament. Further discussions with Sabita (alongside the two of them appearing on a radio interview for Chennai Live 104.8 FM on May 7th, and being featured in Mangayar Malar’s August 1st issue, in connection with the 100 Saree Pact) led to Sumita starting the Facebook group. With Sabita Radhakrishna’s support (Chennai's well-known author, playwright, broadcaster, Crafts Council of India member and supporter of textiles for over 30 years) and Sumita Pai (freelance writer and editor) managing the group, Kai Thari hopes to create a renewed and sustained interest in handlooms. It might just be a drop in the ocean, but it is still a drop! There is growing curiosity among group members (especially the 30’s age bracket of women) to learn about India's handloom weaves. The industry is in the limelight once again with Benaras being PM Modi's constituency, the ‘India Handloom’ brand launch with Ritu Kumar, Shaina NC and others working to revive dying weaves, and so on. As a traditionalist, I love all things ancient..be it craft, textiles, food or even people. Heritage properly preserved has an aura of the exotic, and, when the years pile on, they are layered with history, and little known facts. When I relied on my mother to send me recipes of dishes which I have enjoyed from childhood, it dawned on me that documentation of heritage recipes were important before they languished. It was much later that I decided to document my mother’s recipes and that of others which worked so well along with the tips that went with them. Today thanks to the modern kitchen technology, cooking age old recipes is no longer a chore, and I confess I have tweaked the recipes a bit to make life easier for aspiring cooks. Rather than make the recipes merely Tamil centric I thought I would tap other communities to gather some valuable family recipes from people who are good cooks. The Mudaliar chapter is well stocked with recipes thanks to my mother. I took recipes from the Vellala Christians, Kongunadus, Tamil Muslims, Naidus and Anglo Indians who lived for generations in Tamil Nadu adapting local cuisine as part of their repertoire. I added a little bit of community history for each chapter, and the book with its 110 odd recipes gave a glimpse of what each community offered by way of traditional food. The whole idea, is that this exercise inspires people to put down the recipes handed over to them from generations before they are lost in the annals of time. And the challenge was photographing the dishes, and here I was given support by the then Park Sheraton, now Crowne Plaza Chennai Adyar Park which co-hosted the launch event of Annapurni recently. 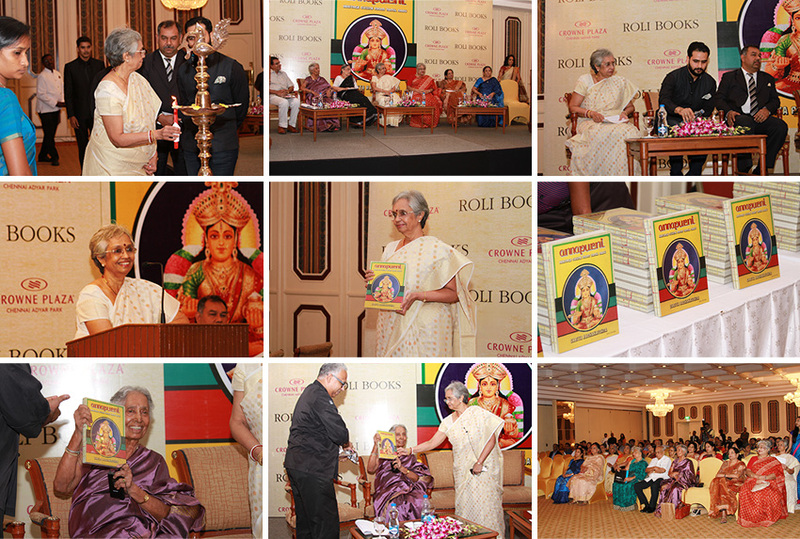 My publishers, Roli Books, brought out Annapurni, Heritage Recipes of Tamil Nadu, scrap book style, to go with my penchant for tradition. About 200 invitees graced the function. Gayathri Kumaresan did an excellent job of knitting the events together and was the MC for the evening. Speakers included Arindan Kunar MD of Crowne Plaza Chennai Adyar Park and Kapil Kapoor Director Roli Books who specially flew down for the launch. I gave an introductory talk on how Annapurni happened, and the Chefs Praveen Anand and Harish talked about their association with me, Abhay Kumar who gave the book the mouth watering food photographs also spoke. I honoured the contributors, by inviting them on stage and to recount their respective forays into cooking. What emerged was a mosaic of interesting experiences. My mother Smt Leela Chander received the first copy of the book and was labelled star of the show by the audience! She spoke about the days when she had scant culinary knowledge and regaled the audience with little fun anecdotes. Pradeep Radhakrishna gave the vote of thanks. We had the hotel serve, along with cocktails, miniaturised versions of food cooked from the recipes listed in the book. The vegetarians were treated to adai cigars with pudina chutney, served on a fork, kuzhiappams in chai glasses with vadagam chutney, puli vadai cakes served in coconut shells with coconut chutney, drumstick semolina curry on spoons, yam crispies in paper cones. A different feast was laid out for the non vegetarians. Brussels sprouts were stuffed with lamb mince, and served in chai glasses, omelette dumplings were cooked in panniyaram moulds and served in mud cups, meat kababs on skewers, the show stopper was crisp fried prawns, and the welcome thayir sadam served in martini glasses, sprinkled with masala boondi and accompanied by varthal kozhambu served in ink fillers! Kudos to the creativity of the chefs in the hotel. The hotel announced an Annapurni Food Festival in the first week of July. Sabita held the post of Secretary Literary Hub of Madras Gymkhana Club for three years, where she organised play and poetry reading, interviews with successful authors, book reading, and talking to people in the news. In August 2010 did a mammoth cooking session along with the cooks, at the kitchens of Park Sheraton Chennai, 25 dishes for 30 people from 11 am to 7 pm! 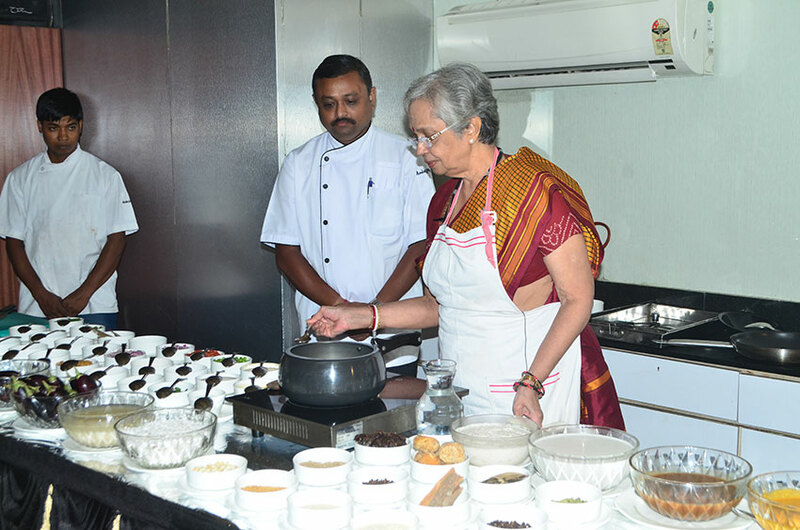 This was a kind of demonstration for the chefs from Sheraton Hotels from across India, and at the end of the evening there was a buffet dinner comprising of all the dishes made, and the chefs plied her with questions and enjoyed the menu. 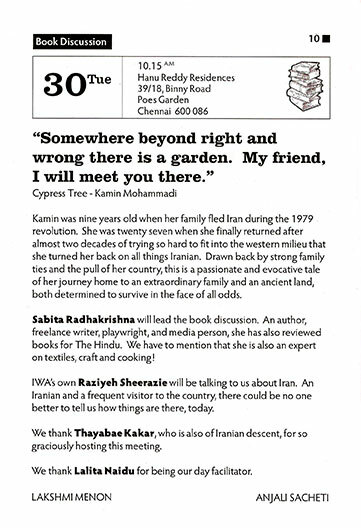 Sabita was invited to talk at the Madras Club on Kancheepuram Textiles for the Madras Week in August 2010. Sabita's talk was illustrated by visuals in a power point presentation. This was repeated at the Business Meet of the Crafts Council of India at Harrisons Hotel. 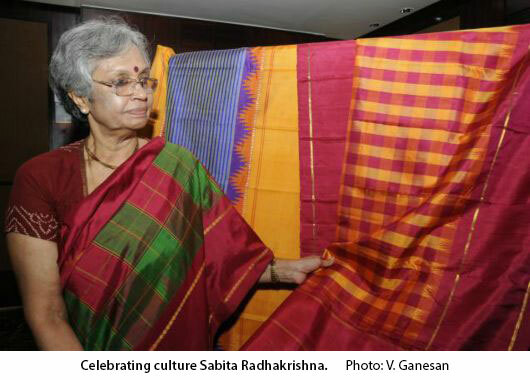 Sabita presented a programme on Pattu Podavais...traditional silk saris of Chennai with a power point presentation called Threads of Tradition in October 2011 at the Sheraton Park Hotel and Towers at the invitation of Hindu Metro Plus for their Namma Chennai Series. Kancheepuram idlis, delectable athirasam, sundal on leaf cups and brass-filtered coffee; copper venneer thavalai and kolu dolls as corner décor and Sabita Radhakrishna as the chief presenter; the topic could only be pattu pudavai, that symbol of grace and grandeur in Chennai's gatherings. 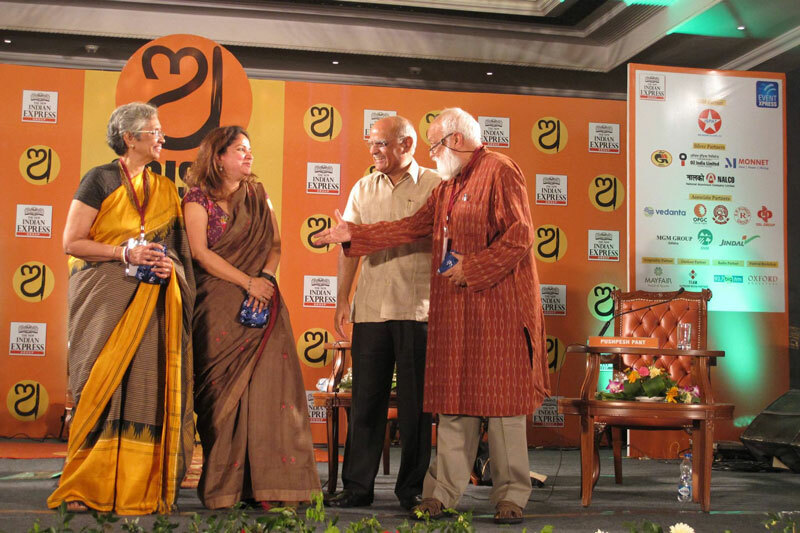 In its second edition of the Namma Chennai meet, a very interested group assembled in their Kancheepuram best to know about the Kanchi heritage and its fabric of international fame. 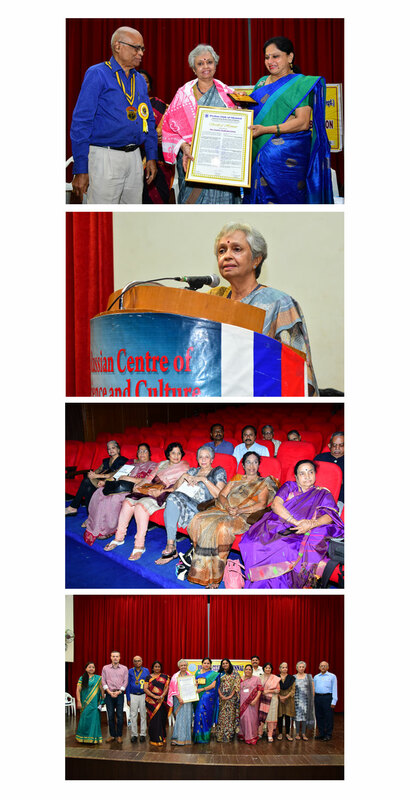 “Pattu is not made of just threads, these are dreams of the weavers,” said Sabita, in a flawless presentation that traced the history of traditional pattu weaving that journeyed into Kanchi some 400 years ago. With stunning pictures as supporting material, she traced pattu's history, its patronage from the local deities and kings. She gave the audience a glimpse of the magnificent sari collection of Rukmini Devi Arundale whose crafts centre at Kalakshetra makes those beautiful Kalakshetra saris. “River Palar flowed in Kancheepuram and its pure waters covered the threads with fine sheen. This patina along with the quality of weaving, weight and durability made Kanchi pattu a must-have in Tamil weddings, gave the textile a niche it so richly deserves,” Sabita went on. Woven into the pattu's history are these facts: Kancheepuram allowed space for the spread-out weaving, had close-knit families and water in the form of Vagvathi. It blossomed when the local deities wore the hand-woven silks and cottons, when the royals gave it patronage. In Kanchi, religion and weaving melded, hand-weaving was done with a sense of bhakti. All activities of the household, preparing the dye, loading the bobbin or twisting the thread, went on around the loom that was the centrepiece of the house. All the members were engaged in the creation of the masterpieces. In an oral tradition, the “secrets” of the art were passed on in a father-son lineage. It was in that sense a truly cottage industry. But all is not well with the industry now despite the crowds at the stores, said Sabita. Saris are not worn regularly and those who wear them choose synthetic yards over Kanchi cottons and silk. Even at weddings, the preference has shifted to other “dresses”. Weavers have started encouraging their children to look for occupations with guaranteed income and job security. Those who still weave have moved on to hybrid threads where wages are higher. Weaving these saris is hard work and the returns are low. Anaka Narayanan, the young designer/boutique owner of Brasstacks, is keen to make that experiment. “Sari is figure-flattering, I love the silhouette, like the aesthetics of the handlooms,” she said. “But to me, design is about what the market wants.” Having tried hand-woven material in her designs, she promised to introduce Kanchi silks and cottons to the young as everyday wear. * Pure zari is red thread wrapped in pure silver and dipped in 24-carat gold. * “Korvai” is when the border and pallu are woven separately and then into the body. The fine weaving between body and border makes the joinery invisible. Here Pallu and border contrast with the main colour. * It takes a week to a month to weave a pattu sari. * The setting up of a loom costs Rs. 80,000 and an extra Rs. 10,000 each time the design changes, so order 3 at a time. * Heavy saris weigh 700-1000 grams. 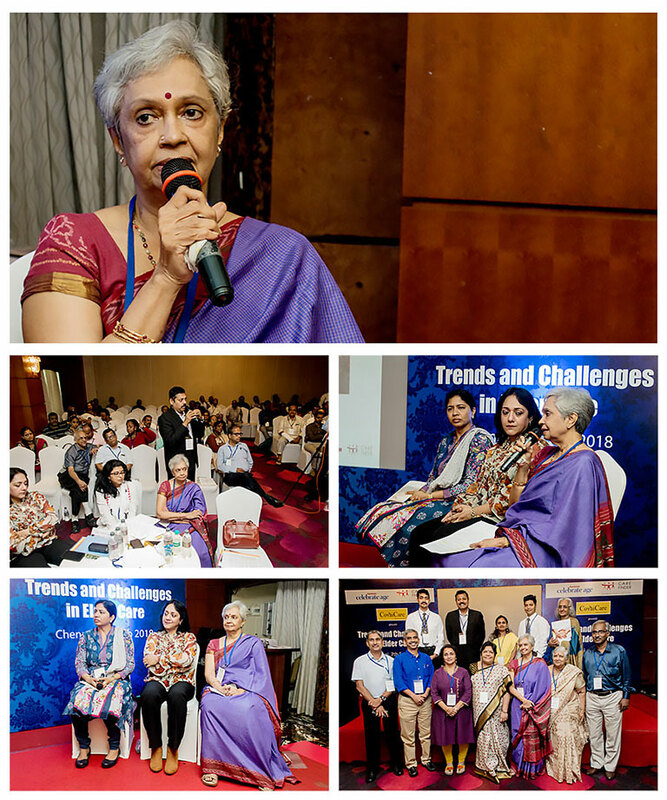 On October 30th, Sabita gave a 40 minute power point presentation with 60 visuals to the International Women’s Association(IWA) at Hotel President Chennai. It was a review based on Soha Parekh’s book Splendour in Threads on Saris. Self-Published KIDS KITCHEN on Kindle Amazon. This is a cookbook for children aged 9-14 and can be read online Kindle. Re-Published Quick Cook...60 minute menus with Partridge/Penquin (Random House Company). 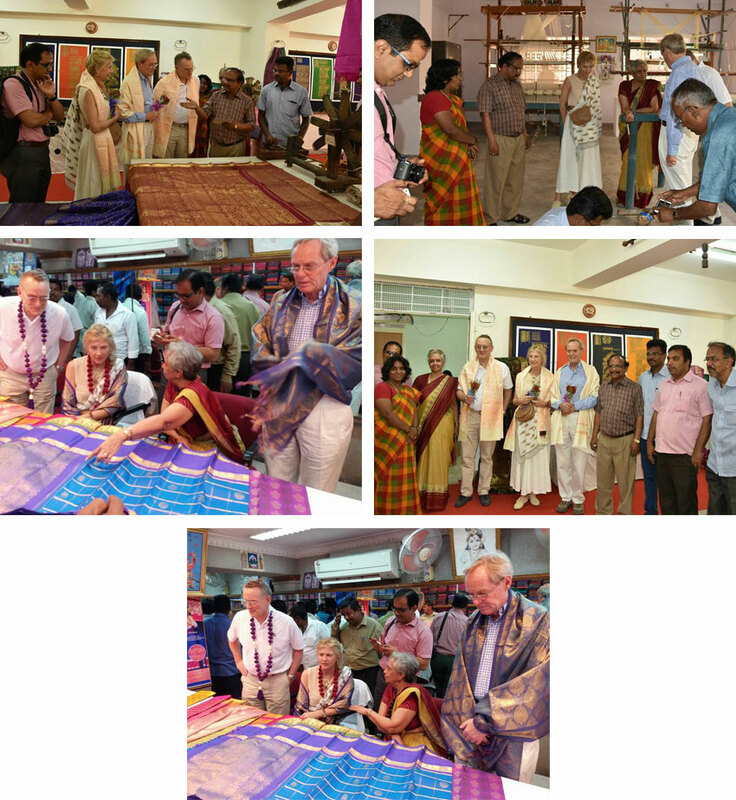 Initiated the revival of the Kodalli Karuppur sari at Kalakshetra a textile that was woven in the early eighteen century for the Maharanis of Thanjavur. 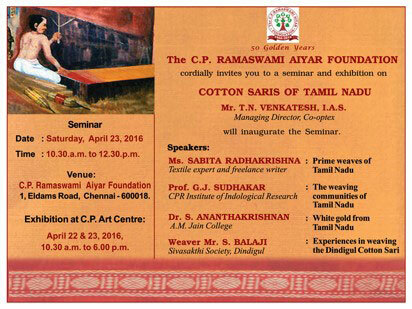 The Karuppur sari disappeared since the nineteenth century. 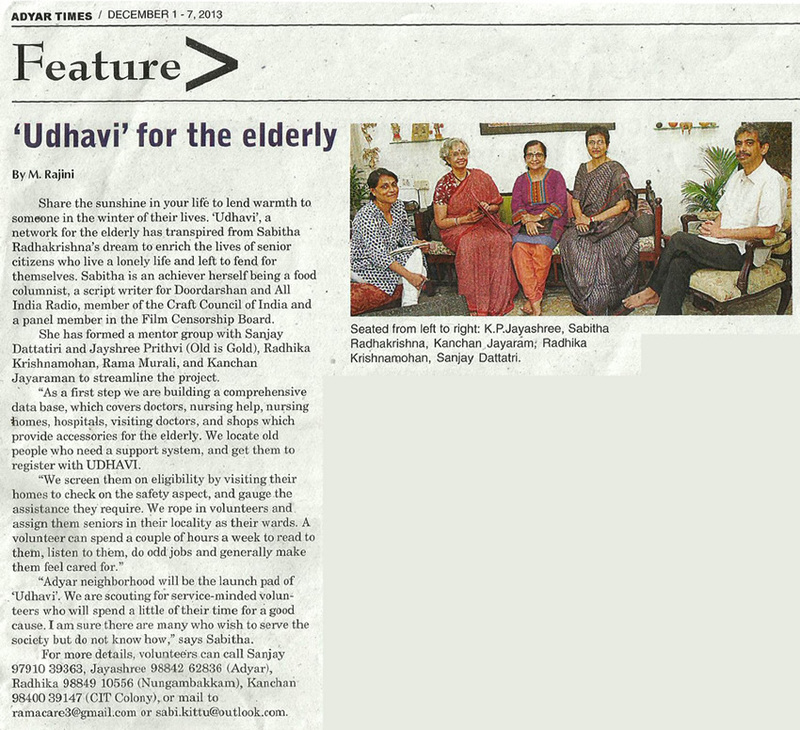 Started a initiative called UDHAVI care for the elderly with the help of 6 core group members and volunteer help. Adyar was set up as a model for UDHAVI and now the movement is spreading through Chennai.